John Garland Pollard was a progressive Democrat who served as a delegate to the Virginia Constitutional Convention of 1901–1902, attorney general of Virginia (1914–1918), and governor (1930–1934). Handpicked by Harry F. Byrd Sr. to be his gubernatorial successor, Pollard left a legacy as governor that was clouded by the fact that he took office on the eve of the Great Depression. While independent-minded, Pollard was never able to get fully out from under the thumb of Byrd. (Supposedly he would remark while patting his belly that he had become so rotund by “swallowing the Byrd machine.”) Byrd’s control over Pollard and Virginia’s political environment was particularly evident in the initiative to legalize alcohol; Byrd went around Pollard to Senator William M. Tuck to gather the General Assembly together in order to push through a state referendum to repeal Prohibition and establish the staterun Alcoholic Beverage Control Board. Outside of politics Pollard was an educator and a member of several public and philanthropic commissions and organizations. As a practicing attorney, he wrote Pollard’s Code of Virginia, which became an often-consulted reference work on the laws of Virginia. He also served briefly as a professor of constitutional law and history at the College of William and Mary in Williamsburg. In 1936 Pollard helped to found the Virginia Museum of Fine Arts in Richmond, the first state art museum in the United States, and served as president of the museum’s board of directors. Pollard was born in King and Queen County on August 4, 1871, to Baptist minister John Pollard and Virginia Bagby Pollard. He grew up in Richmond, attended Richmond College, and graduated from Columbian College (later George Washington University) with a law degree in 1893, the same year his brief study, The Pamunkey Indians of Virginia, was published. Returning to Richmond, he began a legal practice with his uncle, Henry Robinson Pollard. Like his uncle, he became active in local Democratic Party politics as an opponent of the powerful political machine run by Senator Thomas Staples Martin. His legal acumen was confirmed when he began the biennial publication of Pollard’s Code of Virginia, a detailed commentary analyzing and explicating the laws of Virginia that lawyers across the state consulted. He was chairman of the state commission on uniform laws from 1902 until 1907. Pollard began his public career when he won a seat to the Virginia Constitutional Convention of 1901-1902. As the second youngest delegate, he proposed that the word “Christian” be removed from the constitution’s preamble—a proposition that, while defeated, provoked controversy. He also voted against the suffrage provision that would disenfranchise a large segment of the black vote—which was the primary reason for the convention—as well as much of the white vote through a poll tax and other schemes. He continued his association with the independent wing of the Democratic Party and fought, albeit unsuccessfully, for Congressmen Carter Glass and William A. Jones in their bid to unseat Claude A. Swanson and Martin in the 1911 US Senate race. Despite this loss Pollard remained energized and in 1913 declared his candidacy for state attorney general. Campaigning on a platform of electoral reform, aid to education, and support for prohibition, he defeated two candidates who split the machine vote. He, along with Henry C. Stuart as governor, easily defeated their respective Republican opponents in the 1913 autumn election. In February 1914, Pollard became president of the Progressive Virginia Democratic League, which advocated a reform program that included the initiative, referendum, presidential primary, and workmen’s compensation. He also was active in the campaign to pass a statewide prohibition law, which was enacted after a popular referendum in September 1914. As Virginia’s top law enforcement officer, he won the suit against West Virginia that required that state to pay a portion of the pre–Civil War state debt, but more visible was his effort to combat gambling and vice, particularly in areas such as Norfolk, Hopewell, and Colonial Beach. Pollard ran for governor in 1917 as the candidate of prohibition and progress, but a complicated three-way race and the volatile prohibition issue denied him victory. Lt. Gov. J. Taylor Ellyson, who had the backing of the machine, won the support of the Reverend James Cannon Jr., president of the Anti-Saloon League in Virginia; Cannon appreciated Ellyson’s tie-breaking vote that had passed the prohibition referendum through the legislature. The loss of Cannon’s endorsement cost Pollard dearly among the “drys.” Independent Westmoreland Davis, on the other hand, undermined Pollard’s progressive appeal; furthermore, his support of local option on the liquor question rallied the “wets.” When Ellyson and Pollard split the prohibition vote, Davis won a plurality victory with Pollard running third. World War I (1914–1918) offered the Richmonder a retreat from politics and the law. For eighteen months he traveled in France for the Young Men’s Christian Association, bolstering morale and consoling the wounded. After his return, he worked in Washington, DC, in several government agencies before accepting, in 1921, an appointment as professor of constitutional law and history at the College of William and Mary, a perfect match for the cerebral Pollard. But his interest in politics had not abated. He served on the local Democratic committee, as mayor of Williamsburg, and was appointed by Gov. E. Lee Trinkle in 1922 to be a member of the Commission on Simplification and Economy in Government, where Pollard applied his knowledge of the tax laws to recommend changes to the state’s tax structure. 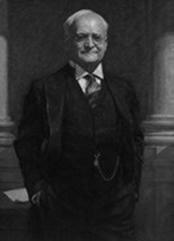 His work on the commission drew the attention of the recently elected governor, Harry F. Byrd Sr., who, in 1926, began consulting Pollard on tax questions. Although skeptical of Byrd’s credentials, the ever-independent Pollard was won over by the governor’s progressive agenda to reorganize state government and the tax system. He advised the reorganization effort and campaigned energetically for the amendments that would implement the changes. The relationship with Byrd was cemented by Pollard’s work in the 1928 presidential campaign where Pollard encountered his old nemesis, James Cannon. Now a Methodist bishop, Cannon was supporting the Republican candidate for US president, Herbert Hoover, in his effort to advance Prohibition and regain political prominence in Virginia. Cannon apparently offered Pollard his support in the governor’s race the following year if he would shift his support to Hoover from Democratic candidate Al Smith, who opposed Prohibition. Fearful of Cannon’s threat to Byrd’s programs and angry over the religious attacks against the Catholic Smith, Pollard remained loyal to the party and campaigned unsuccessfully for Smith’s election. Pollard was rewarded for his loyalty when Byrd handpicked him to be his successor. The 1929 gubernatorial race promised to be difficult for Democrats, given the defections from the party in 1928 and the persistence of the liquor and religion issues. But Pollard’s “dry” record, his prominence as a Baptist layman, and even his independence convinced Byrd that he was the best candidate to defeat Cannon and the Republicans. With the active support of the Democratic hierarchy, Pollard easily won the Democratic primary and trounced Republican William Moseley Brown in the general election when Cannon was discredited by charges of stock market gambling and misappropriation of church funds. The victory was a vote of confidence for Byrd and marked Pollard’s reconciliation with the machine. Pollard had the great misfortune to govern during the Great Depression. The stock market crashed on the eve of his election victory, and during the next four years, the national economy plummeted to record lows in manufacturing production and employment, with record highs in bank closures. It stifled any opportunity for Pollard to maintain Byrd’s “program for progress” and initiate his own reforms. His efforts to tackle the problems of education, agriculture, and county government were only marginally successful. Commissions were established to study the questions, and some improvements were made in the oyster industry and the workmen’s compensation law. Even the weather did not cooperate; a major drought hit the country in 1930, devastating Virginia’s farmers. Pollard appointed Byrd to chair the Drought Relief Committee, which relied on private charities, railroad rate reductions for farm goods, federal loans to farmers, and the employment of farmers on the state highways to combat the emergency. A strike at Dan River Mills in 1930 further challenged the governor’s talents. His offer to mediate was rejected by management and, with the threat of violence looming, he called out the National Guard to preserve order; the strike collapsed a few months later. These crises ensured that Pollard governed with Byrd constantly looking over his shoulder to secure his legacy of sound government and balanced budgets. Overwhelmed by events, the governor resigned himself to following Byrd’s advice. He wrote to his predecessor, “It is indeed comforting to feel that I have so strong an arm to lean upon.” Byrd had great respect for Pollard, but he was not reluctant to offer suggestions on legislation, budgets, and appointments; nor was he averse to going behind the governor’s back to advise legislators and bureau chiefs on what policies had to be followed. Thus, the single-minded response of Virginia to the Depression was “pay as you go”—balance budgets, reduce spending, and avoid tax increases. State relief programs were rejected, and no funds were to be appropriated to match available federal money once President Franklin D. Roosevelt’s New Deal began. In the words of William Reed, one of Byrd’s closest advisors whom Pollard appointed to head up the state’s Committee on Unemployment, “We must keep Virginia like she is without any changes.” Reed’s committee underestimated the number out of work and recommended reliance on private charities and a shorter workweek to meet the crisis. To address the growing unemployment problem, Pollard pursued advances in federal road money and Reconstruction Finance Corporation loans to employ Virginians on state roads. In the 1932 General Assembly, Pollard, at Byrd’s behest, requested and received authority to cut all state employees’ earnings, including his own, as well as general appropriations in order to avoid a deficit. In his remaining months in office, Pollard instituted three 10 percent reductions in appropriations. An effort to divert funds from highways to schools was opposed by Pollard and Byrd, who countered with a plan—the Byrd Road Act—for the state to take over construction and maintenance of county roads to alleviate the tax burden of stressed localities. A final sting remained. Demands to repeal Prohibition were growing nationally and in Virginia. Revenues from the taxing of beer offered a bonanza to depleted treasuries. The issue also threatened to intrude on the 1933 gubernatorial election, an unpleasant possibility for Byrd, who changed course and now urged a special session of the General Assembly to legalize the sale of alcohol. Befitting his Prohibition convictions, Pollard objected, but he was rebuffed by public demand and machine authority. The legislature called itself into session, legalized the sale of beer, and set up a repeal referendum that voters approved in October. An Alcoholic Beverage Control Board to supervise the distribution and sale of hard liquor was established by the 1934 assembly. In his post-gubernatorial years, Pollard served as chairman of the Board of Veterans Appeals in Washington. He also served as president of the board of the Virginia Museum of Fine Arts, whose founding he had facilitated by raising money for its creation. Pollard married Grace Phillips in 1898; they had four children, three of whom lived to maturity. His wife died in 1932, and a year later he married Violet MacDougall, his executive secretary. Pollard died on April 28, 1937. Source of information: Information about John Garland Pollard was contributed by Ronald L. Heinemann and is courtesy of Library of Virginia, a publication of the Virginia Foundation for the Humanities in partnership with Library of Virginia.